▷ ViaMichelin Navigation X-950T update. Speedcam for your maps. Download update. Free custom download. 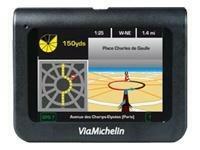 In order to update your GPS device: ViaMichelin Navigation X-950T with the latest update, follow next instructions. First of all, be sure you got the update file for your ViaMichelin Navigation X-950T device, downloaded from SpeedcamUpdates.com. Start the Content Manager. Click on the category identified as "My ViaMichelin". Then Click on "Create folder". Click the "My POIs" category and name your folder "speedcam". Click on [...] to select the *.asc file. Select also the Icon. Click "OK". Repeat the last steps for each speedcam file. Start synchronisation to transfer the speedcams to your ViaMichelin Navigation X-950T device. After importing files on your ViaMichelin Navigation X-950T device, you can configure the display and the POI_ alert.